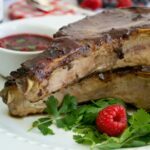 A pan-seared pork chop recipe with a berry-dijon glaze and a berry-cilantro dipping sauce. Easy to make but tasty enough for company. This post is sponsored by Bonne Maman. First, What is a Ribeye Pork Chop? A ribeye pork chop comes from the rib portion of the loin. It’s the chop with a big bone running along one side. It used to be called a Rib Chop Center. The National Pork Board introduced new names for many pork cuts so that they’d be easier for customers to identify and remember. The new names parallel the names we use for beef. So now we have a ribeye chop, a porterhouse chop, and a New York chop. Easy, right? See here for more info about the new names for cuts of pork and here’s a chart with pictures of the pork cuts. Great info! I love learning about pork. That’s probably because I’m a bit of a pork geek and people seem to like it. My post for How to Roast Pork Perfectly is the most popular one on my site. And this post for perfect pork chops is doing great too! OK, onto today’s recipe. Why pork and jam? Pork and sweet fruit are buddies. And when the fruity flavor is intensified, like in apple sauce or in a jam or preserves, it’s even better. This recipe uses preserves in two ways. First, it’s mixed with Dijon mustard as a glaze for the chops. Then, it’s mixed with mashed fresh raspberries, cilantro, lime juice and a bit of soy sauce to make a dip for the pork. The colors and flavors in this dish are amazing! 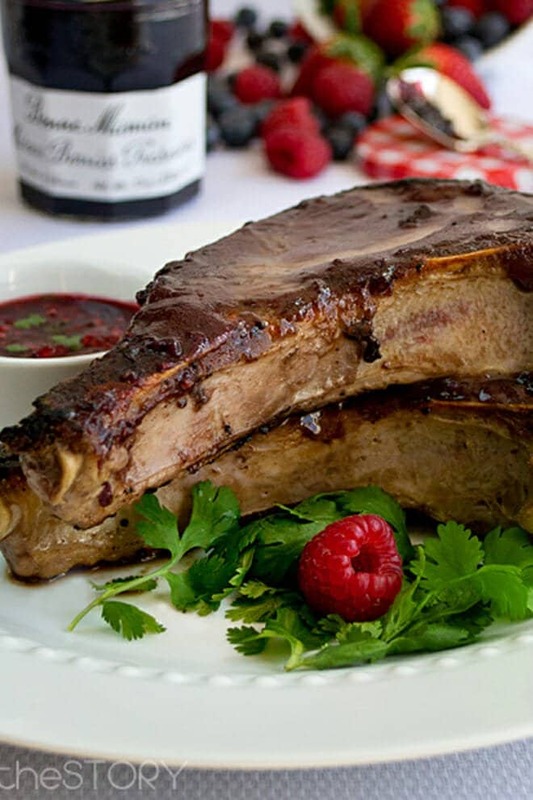 A pan-seared pork chop recipe with a berry-dijon glaze and a berry-cilantro dipping sauce. Easy to make but tasty enough for company. Warm a large oven-safe skillet over high heat on the stovetop. Blot the pork chops dry with kitchen towel and then rub each one with 1/2 teaspoon of the oil, making sure to oil both sides of each chop. Sprinkle both sides with salt and pepper, using 1/4 teaspoon of salt and of pepper per chop. When skillet is very hot, put the pork chops in. Reduce heat to medium-high. While the chops cook on the first side, combine the jam and mustard in a small bowl. Once the chops are well-browned on the underside (about 4-5 minutes), flip. Brush tops liberally with the mustard sauce and then transfer the skillet to the oven. Bake until internal temperature of the chops is 145F for rare or 155F for medium (use an instant-read thermometer to get the temperature reading), about 4-6 minutes. While the pork chops are in the oven, use a fork to mash the raspberries in a small bowl. Stir in the remaining 2 tablespoons of jam, the cilantro, soy sauce, lime juice and a pinch of salt. Taste. Raspberries always have different levels of sweetness. If the sauce is too sweet, add up to 1/2 teaspoon more lime juice. If too tart, add an extra teaspoon of jam. When chops are cooked to desired doneness, transfer to a plate and let rest for 3 minutes. Serve with the berry-cilantro sauce on the side for dipping. This post originally appeared in March, 2014 and was revised and republished in May, 2018. Disclosure: I have been paid by Bonne Maman to develop this recipe and post about it here on my blog. They also supplied the items for a giveaway which has been removed from this post. All opinions are my own.